Dr. Roopnarine received a Bachelor Of Veterinary Science (BVSc) in 1996, Faculty of Veterinary Medicine, University of Liverpool, England, UK. During 1997 and 1998, Dr. Roopnarine was a Clinical Scholar in Companion Animal Studies at the Faculty of Veterinary Medicine, Glasgow, Scotland, United Kingdom. In 2003-2005, Dr. Roopnarine was a Medical Sciences Scholar at the University of the West Indies (UWI) where she received an M. Phil in Veterinary Public Health, UWI, Trinidad, West Indies and received an award of 1000TTD for completing her M. Phil thesis in the minimum 2 year period. 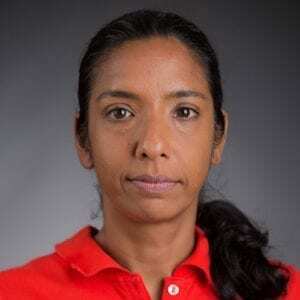 Since 2007, Dr. Roopnarine has held the position of Assistant Professor, Veterinary Public Health, at St. George’s University, Grenada, West Indies. Her clinical experience includes practicing as a veterinarian in Wales, UK (1998-2000), at Northwest Veterinary Clinic, Mucurapo, (2003-2007), and equal partner with Dr. Vincent Moe in Vinmer Veterinary Clinic, Small Animal Practice, Port-of-Spain, Trinidad, (2001-2002). Dr. Roopnarine’s teaching experience includes a position as Assistant lecturer in Small Animal Surgery, Medicine and Anaesthesia at the University of the West Indies, Trinidad in 2000-2001. Roopnarine RR, Ammons D, and Adesiyun AA. Frequency of antimicrobial resistance of E. coli isolates from dairy farms in Trinidad by source and presence of virulence markers.Veterinarski Arhiv. 2009, 79 (3), 229-243. Roopnarine RR, Ammons D, and Adesiyun AA. Application of immunomagnetic separation (IMS) for the detection of Escherichia coli O157 on dairy farms in Trinidad. West Indian Veterinary Journal. 2009, Volume 9 No 1.